His face and hands were soft and worn like very well loved leather. He sat in bed and chuckled loudly and deeply. We’d caught him in bed listening to the news, still in his night rag as he called it. We talked about everyday things like how he was going to start going through his slides again and print some photos up. We talked about the food he was going to eat for lunch and dinner. My mom even sorted it all in the fridge so he could get it out easily. We talked about the book he wanted – by a woman he very much respected. It wasn’t a very long visit because we had to get up to the city to do some Christmas things. So we said goodbye. I leaned over him in his bed and kissed him on both cheeks. I said, “We’ll see you soon, Grandpa.” He said, “Okay, Mate.” He called me “Mate” (pronounced “mah-te”), short for “matemasell” because once upon a time when my mom was a child, someone who spoken broken French called her “matemasell” instead of “mademoiselle”. He liked it – so it became his name for me. Three days later on December 7th, in the early hours of the morning, my grandfather passed away. He is missed more than I can say in words but he lives on in our hearts and we treasure all the memories, even the little every day ones. Especially the little every day ones. So this Toas-Tite is in his honor because he always loved huevos rancheros – you couldn’t go wrong with a good plate of beans, salsa, a fried egg with a tortilla rolled up on the side, which he’d use in place of another utensil. So cherish all your moments. Make memories this holiday season. Take photos. Give great big hugs. And if you’re in the mood one morning, have some huevos rancheros to start your day and raise a glass to all those gone by and my sweet Grandpa Tony. Start by cracking your egg into a small bowl. Place one tortilla onto the ungreased pie iron (only if your pie iron is very well seasoned – if you need to, spray a bit of non-stick spray to be sure you don’t get a stuck tortilla). 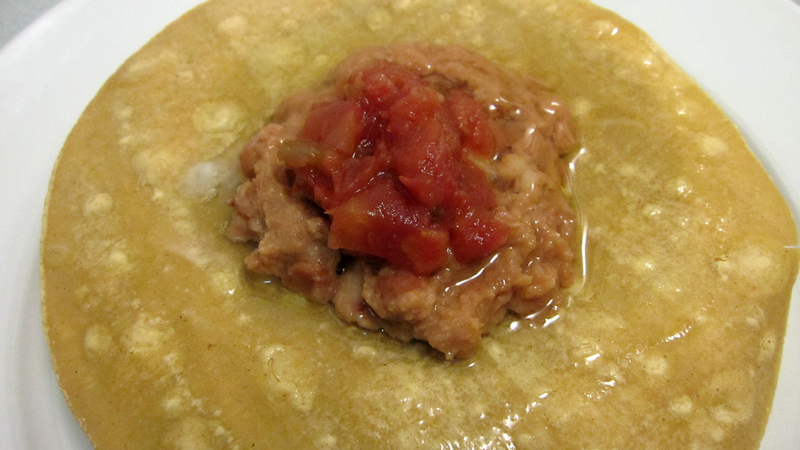 Dollop 2 tablespoons of refried beans onto the tortilla. 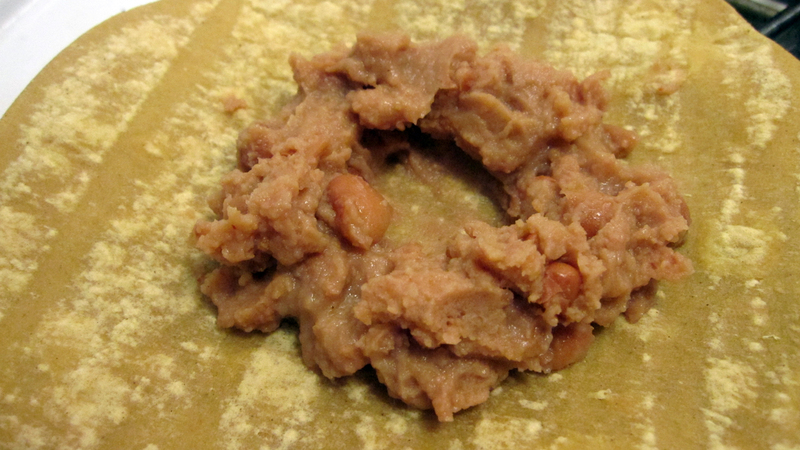 Make a small ring with the beans with a hole in the center where your egg yolk will sit. With a pastry brush, brush some of the egg white around the outside of the tortilla to help ensure a closed seal. 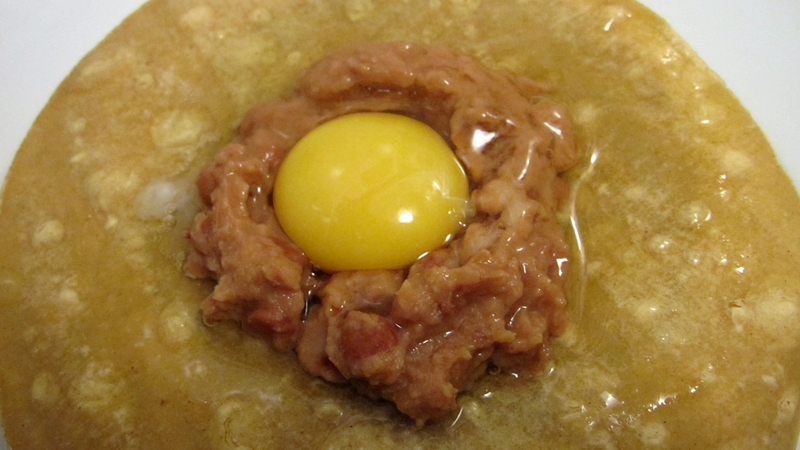 Using a spoon, pull the yolk (and some egg white) out of the bowl and gently place it into the center of the refried beans. The ring you created will help hold it in place so it doesn’t shift around as you complete your pudgy pie. If you’d like, salt and pepper your yolk at this point. Add the salsa on top of the egg. Carefully place the other tortilla on top. Close the grill, trim the excess tortilla, and toast for 6 minutes – 3 minutes on either side – over medium heat. Toast for a bit longer if you prefer a more thoroughly cooked yolk. An extra minute or two will cook the yolk significantly more so if you prefer a hard yolk to a runny one, keep that in mind. 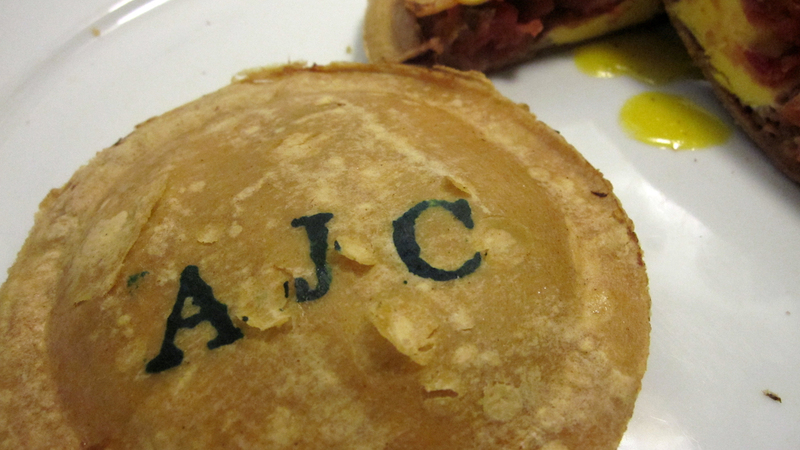 Also, for those of you curious how we got my grandfather’s initials onto the pudgy pie….we used rubber stamps and food coloring. Check out our SJ Sharks post for more details on doing that kind of thing. And let’s just quickly talk salsa. My grandfather’s favorite salsa was El Pinto Hot Salsa. It’s only available in a few stores here and there so any time we see it, we stock up. But hot…well…it’s actually very hot. Medium is quite hot too. Both are delicious and full of flavor. If you can’t find El Pinto, of course use whatever your favorite salsa is. But for one AJC, it had to be El Pinto. And for us….it was delicious. For other related reads and family recipes, here is recipe from my sister-in-law, SodiumGirl. So now don’t wait – go give your loved ones a big squeeze and enjoy it all. Great story! Very memorable and sweet. And, the Mexbreakfast looks delish. I will try it! Mi linda, te quiero con todo mi corazon. Que alegria tenernos, amarnos y disfrutar de esta vida juntos todos. Gracias por tu espiritu y tu presencia tan bellos. Y salud a nuestro Tony. Your story is very well written and very touching. The breakfast looks yummy, can’t wait to try it. Thanks for the beautiful photos! Thanks so much for the comments, all. If you give it a try, I’ll be excited to hear what you think.